I first became acquainted with Lisa Torcasso Downing through her insightful posts and comments about Mormon literature and creative writing on Dawning of a Brighter Day, the blog of the Association for Mormon Letters. Later, I had a chance to teach her short story "Clothing Esther" in a class I taught on religious fiction at my university. While none of my students was Mormon, nearly all of them voiced appreciation for Lisa's story--which, in my opinion, is a great testament to her gifts as a Mormon writer. Lisa has recently published two novels (see here and here) for children under the pen name L. T. Downing. The most recent, Get That Gold! (Zion BookWorks, 2013), is the first book in an ongoing series called The Adventures of the Restoration. Based on early Mormon histories like Lucy Mack Smith's biography of her prophet-son, the novel is about the Smith family's struggle to get the plates from the Hill Cumorah to the safety of their home--without Joseph getting waylaid by scheming men who want the gold plates for their own. It's a suspenseful children's novel that lives up to what any kid (or parent) would expect from an adventure story. Since children's literature is not my forte, I enlisted the help of Connor, my book-addicted nine-year-old daughter, for this interview. We read the novel together--at 131 pages, it's a quick read--and then came up with questions for the author. Connor Hales: How do you come up with ideas when you write your books? L. T. Downing: The ideas for the Adventures of the Restoration series came because I love history and storytelling. I have read a lot of history books about the early days of the church, but those books were too boring to read to my own children. So I began telling them about the really amazing things that went on during the Restoration period. Next thing I knew, I was writing those stories down. CH: When did you decide that you were going to become a writer? LTD: I remember the moment I decided to be a writer like it was yesterday. I was four years old. When I was a baby, I never learned to crawl and a very famous baby doctor had written a book that claimed that babies who never crawl are likely to have trouble learning to read. My mother was worried I wouldn't be a good reader so she started teaching me as soon as I turned four. To her surprise, I took to it very quickly. One day I was sitting with her on the edge of my parents' bed, reading a story that had a big red can in it. My mom kept telling me there was no red can in the story. I got mad and kept pointing to the word. "C-A-N," I said. Then she pointed to the last letter and asked me to look again. Well, can you believe it? The word was spelled "C-A-R." The big red car. Not can. I was astonished that changing one little letter at the end of word could change the entire meaning. That's when my mom said, "When you grow up, you can go to college and study English. And if you want, you can become a writer." Bam! Decision made. At the age of four, I couldn't imagine anything more wonderful—and powerful—than creating meaning by arranging letters into words and words into sentences and sentences into books. I still think that. CH: Was it fun writing the book? LTD: YES! There is nothing that is more fun than writing books for kids. Except for Halloween. And Christmas is pretty good too. CH: How long did it take to get your book published? LTD: Don't ask! I wrote Get that Gold! and the next book in the Adventures of the Restoration series (The Pilfered Papers) when my oldest child, who is twenty-four now, was about ten years old. I mailed the manuscript to two LDS publishers in existence then. I was told that the first publisher to whom I sent it would take it, but, in the end, the person with the final word rejected it. He said he didn't think it was a good idea to publish a novel with Joseph Smith as the point of view character. 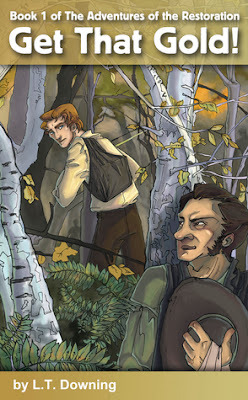 After all, no one knows exactly what Joseph Smith was thinking when those men in the woods attacked him. I guess the publisher thought kids might get confused and not understand what fictionalized history is. But personally, I think kids are really smart. The other publisher I sent it too didn't seem to understand that it was written for young people because they sent me a nice letter explaining how I should make the work much, much longer and more like The Work and the Glory series, which was written for adults and has books that are hundreds and hundreds of pages long. I felt sad that they wouldn't publish the Adventures of the Restoration series because I really felt like Heavenly Father inspired me to write them. But I also figured I'd just trust Heavenly Father and move on to the next thing. Your mom and dad will probably tell you that God's time schedule is not the same as ours. They are right. Nearly fifteen years after writing Get that Gold!, it found a publisher. CH: How did you become interested in Joseph Smith? LTD: I became interested in Joseph Smith when I was fourteen years old. Before then, I'd never heard of him. I was raised in the Catholic church. But I began hearing about Mormons when I was in eighth grade, so I looked them up in the encyclopedia. That was the first place I learned about the First Vision. I went to the public library and checked out a Book of Mormon. I did a lot of praying and received a testimony of the work of Joseph Smith. I always thought he was very brave. I know sometimes I was scared about joining the church because my family and other people didn't believe that the gospel needed restoring. I spent a lot of time thinking about how brave Joseph Smith had to be to do what he did. He wasn’t a perfect man. He made mistakes. We all do. But he is my hero. So it helps my testimony stay strong to think about the hard things he had to do so we could have the gospel of Jesus Christ restored to the earth. Scott Hales: What challenges do you face writing for young audiences that you don't face writing for adults? LTD: The challenges are the same: A writer needs to assess the audience, respect the audience, and deliver a story that meets the audience’s expectations. Writing for children and teens, however, is a lot more fun, in my opinion, than writing for adults. The writing I do for adults tends to be literary in nature and, therefore, my audience tends to be trained to critique, to tear into and tear apart, narrative. That's frightening and tends to make me very circumspect about my work. But children read (or are read to) for the fun of the story. They neither over nor under think it. They feel the emotion and either enjoy the ride or get off the ride (also known as closing the book and walking away). Writing for children is great fun because it lets me step back in time and remember the kinds of stories that I used to get swept away in. If you were hoping for some reflection on the greater responsibility of feeding the lambs as opposed to the sheep, I'm afraid I’m going to let you down. I don't believe we need to sugar coat our history for our children, though certainly some aspects of it may be better held in reserve until they achieve the level of maturity required for it. SH: When writing historical fiction, how do you find the right balance between history and fiction? LTD: The Adventures of the Restoration series is going to stick to historical tales that are fairly well plotted out for me by the primary players themselves or by historians who've done the leg work and pieced the experience together. For instance, the series will not invent a family to undergo the trauma that was Haun's Mill, but will rely on the tales left behind by the actual participants. There are other series that use fictional characters placed in historical events. My goal is to tell the real world stories, staying as true to the course of events as I can and reflecting the genuine personalities as best we understand them. Of course, the books will all have several fictionalized characters. For instance, in Get that Gold!, all three of the men who attack Joseph are entirely fictionalized because Joseph's mother, from whom we get the story, didn't indicate their identities were known. So for me and with this series, the priority will be reflecting the historical events to the best of my ability and filling in and fluffing up those stories with the tools fiction provides me. I'm not exactly looking for balance, per se. It's more like I'm seeking solidity. The plain history is porous, which doesn't make for enlivening reading for children, so I fill in the pores with fiction. SH: Who was the hardest character to write? LTD: In Get that Gold!, Emma was the hardest to write because she is perhaps the most complicated major figure from the Restoration and I don't want to reduce her to a stereotype. And we really don't know what her role was the night Joseph received the plates. When publisher Michael Perry indicated he wants me to focus on female characters in later novels in the Adventures of the Restoration series, I teased that I'd love to write about polygamy from Emma's perspective. And I just might do it if I can find a way in to the issue that is adventurous in a kid-friendly way. And if Perry is on board. But I wouldn't hold your breath for that one. SH: Why approach the Restoration as an adventure? LTD: Because of a band of ruffians searching the woods for Joseph and the gold plates. Because of stolen manuscript pages and covert operations to keep the manuscript safe. Because of repeated armed attacks. Because of tarring and featherings. Because of the persistent theme of betrayal. Because homes were burned and other property destroyed. Because militias made promises and broke them in ways that left people dead. Because, in spite of it all, the Book of Mormon was published. Because our missionaries traveled to unfriendly places. Because our people built lives, had them destroyed and built them over again. Because of whistling brigades of children who protected a city and little girls who saved scripture in the midst of a chaos. Because the Restoration is adventure, from a boy entering the woods and talking to God face-to-face to the moment those wagons began churning toward the Missouri River and away from Nauvoo. I read the history of the Restoration era and see nothing but story after story that is rife with intrigue and risk and the kind of danger that threatens well-being. I see stories kids deserve to hear told in a way that will keep them invested, grow their compassion, and reassure them that they needn’t be perfect to be disciples of God. SH: Can you give us a preview of Book Two? LTD: The Pilfered Papers revolves around the loss of the 116 pages of manuscript. In Book Two, LDS children will not only meet Martin Harris, but his so-much-fun-to-write wife, Lucy. I think most LDS adults have some familiarity with the basic story of how the beginning portion of the Book of Mormon was lost. That's the framework of The Pilfered Papers. But in this story, as much as any other novel in the Adventures of the Restoration series, I'm interested in the human side of the story—what made the characters (or, historical figures) tick. L. T. Downing (Lisa Torcasso Downing) is the author of Island of the Stone Boy. She has published fiction for young people in the Friend and New Era magazines. She received her Bachelor of Arts degree from Brigham Young University and a Master of Arts degree from Texas A&M-Commerce. She also writers literary fiction and served for three years as the fiction editor for Irreantum, the literary journal published by the Association for Mormon Letters. She lives in Heath, Texas, with her family. Scott Hales lives in a small house in a suburb of Cincinnati with his wife and three daughters. He spends a lot of his time reading Mormon fiction and trying to come up with original things to say about it. On weekday mornings, he gets up at 4:40 to teach seminary. On weekday evenings, he and his wife watch network television and wonder what it must be like to have a satellite dish and 400 channels. During the daytime, he is a graduate student in the Department of English and Comparative Literature at the University of Cincinnati. He doesn't like pets or home repairs. He always likes to watch superhero cartoons with his kids. Sometimes he rides a mountain bike in the woods behind his neighborhood. When he's feeling particularly nostalgic, he'll pull out his masterfully written mission journals and remember the days when he didn't sport sideburns. Twitter: @TheLowTechWorld. Blog: low-techworld.blogspot.com.